So we're working towards this vision, starting today with new customization options for your blog. 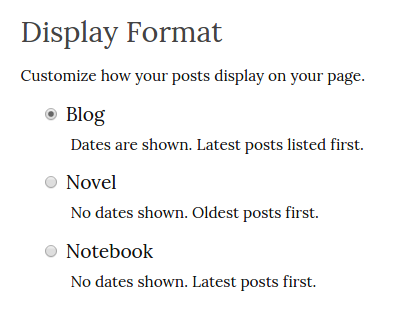 Now Pro users can choose between two formats besides the current “blog” setup. The Novel format presents your posts in chronological order, so you can build it over time. Maybe each post is a chapter, or even an entire novel, as part of a series. Now readers can visit your “blog” and read passages in the order they were written in. The Notebook simply hides the dates of your posts on your blog, for those timeless thoughts you simply want to get down somewhere. These new options are only the beginning. Each represents more than the order to show your posts, but a hint at the medium that you, the writer, want to show your words in. So in the future, Novel blogs might be downloadable in ePub or PDF formats; a new Diary option might be completely private, or have password protection. As you try it out, let us know what you want to customize, and how you'd like to use your blog. We're open to all ideas that help you and other writers publish in new ways.